Millennials will soon become the nation’s largest living generation. They already have surpassed Generation X to make up the largest share of the U.S. workforce. Despite the size and influence of the Millennial generation, however, most of those in this age cohort do not identify with the term “Millennial.” Just 40% of adults ages 18 to 34 consider themselves part of the “Millennial generation,” while another 33% – mostly older Millennials – consider themselves part of the next older cohort, Generation X. 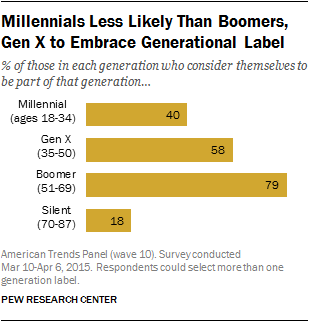 The oldest cohort of Americans is by far the least likely to embrace a generational label. 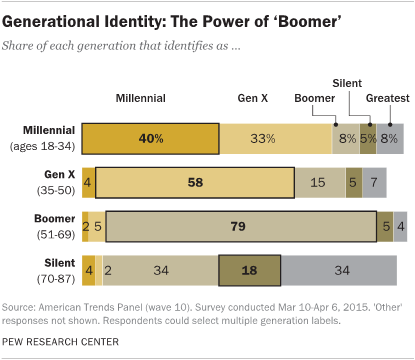 Just 18% of those ages 70 to 87 (the age range of the Silent Generation) actually see themselves as part of the “Silent Generation.” Far more Silents consider themselves part of adjoining generations, either Boomers (34%) or the Greatest Generation (also 34%). The national survey by the Pew Research Center was conducted March 10-April 6 with 3,147 adults who are part of the American Trends Panel, a nationally representative sample of randomly selected U.S. adults surveyed online and by mail. Respondents were given five commonly used terms for generations, including the “Greatest Generation,” and asked whether they considered themselves part of these generations. The survey finds that some generational names – particularly Boomers – are more widely recognized than others. Among all respondents, fully 89% say they have heard of the Baby-Boom generation, while 71% have heard of Gen X. A majority (56%) have heard of the Millennial generation, but just 15% of all respondents (including only 27% of Silents) have heard of the Silent Generation. The survey also asked if a number of descriptions applied to the people of their generation. Silents are far more likely than people in younger age cohorts to view their own generation in a positive light. Large majorities of Silents say the people of their generation are hard-working (83%), responsible (78%), patriotic (73%), self-reliant (65%), moral (64%), willing to sacrifice (61%) and compassionate (60%). Boomers also tend to have favorable impressions of their generation, though in most cases they are not as positive as Silents. By contrast, Gen Xers and Millennials are far more skeptical in assessing the strengths of their generations. And Millennials, in particular, stand out in their willingness to ascribe negative stereotypes to their own generation: 59% say the term “self-absorbed” describes their generation, compared with 30% among Gen Xers, 20% of Boomers and just 7% of Silents. On several measures – including hard work, responsibility, willingness to sacrifice, and self-reliance – the share in each generation expressing positive views declines step-wise across age cohorts, from the oldest to the youngest. For example, 83% of Silents describe the people of their generation as hard-working, as do (77%) of Boomers. A narrow majority of Gen Xers (54%) say people of their generation are hard-working, while 36% of Millennials say that phrase describes people in their cohort. The survey includes 18 descriptions – a mix of positive, negative and neutral terms. On some terms, such as environmentally-conscious, entrepreneurial and rigid, there are no significant differences across cohorts in the shares saying each applies. There is only one description – “idealistic” – on which a generation other than the Silents views itself most positively: Somewhat more Millennials (39%) than Gen Xers (28%), Boomers (31%) or Silents (26%) describe their generation as idealistic. Generational names are largely the creations of social scientists and market researchers. The age boundaries of these widely used labels are somewhat variable and subjective, so perhaps it is not surprising that many Americans do not identify with “their” generation. Yet the Boomer label resonates strongly with the members of this generation; the name arose from the fertility spike that began shortly after World War II and continued through the early 1960s. Fully 79% of those born between 1946 and 1964, the widely used age range of this generation, identify as Boomers. That is by far the strongest identification with a generational name of any cohort. The Millennial generation also encompasses a broad span of adults (currently those born from 1981 to 1997). But just 40% of those in this cohort consider themselves Millennials, while as many as a third (33%) say they belong to Gen X. Among older Millennials (ages 27 to 34), 43% consider themselves Gen Xers, while 35% identify as Millennials. Yet even among younger Millennials (ages 18 to 26), fewer than half (45%) consider themselves part of this generation. Most adults (58%) born between 1965 and 1980, the birth years of Gen X, identify with “their” generation. Notably, relatively few Gen Xers (just 4%) identify as Millennials, but 15% consider themselves Boomers. Among younger Gen Xers (ages 35 t0 42), 68% identify with Gen X; among older Gen Xers, fewer (48%) see themselves as part of this generation, while 24% identify as Boomers. Most Silents identify with either the Greatest Generation – people born before 1928 – or as Boomers. Older Silents (age 80 to 87) tend to see themselves as part of the Greatest Generation; 51% say they are part of that cohort. Among younger Silents (70 to 79), close to half (45%) identify as Boomers. Aside from being asked about their generational identity, respondents also were asked how well each generational term applies. In this case, the differences between Boomers and the other three generations are even starker. Seven-in-ten Boomers (70%) say the term “Baby-Boom generation” applies to them very well (31%) or fairly well (39%). 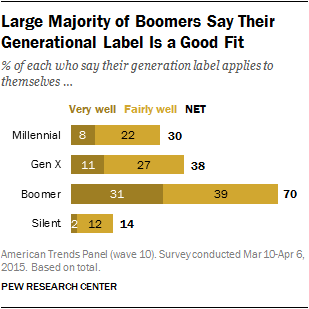 Among other generations, no more than about four-in-ten (38% of Gen X) say their generational label is a good fit. As with many positive generational descriptions, there also are wide differences over whether negative terms apply. Millennials are far more likely than older generations to say the terms “self-absorbed,” “wasteful,” and “greedy” apply to people in their age cohort. While 59% of Millennials describe the members of their generation as self-absorbed, 49% say they are wasteful and 43% describe them as greedy. On all three dimensions, Millennials are significantly more critical of their generation than older age cohorts are of theirs. And while Silents are more likely than other generations to say that several positive terms describe their generation, they also are less likely to say some negative terms apply. Only about one-in-ten Silents see the people of their generation as self-absorbed (7%), wasteful (10%) and greedy (8%) – by far the lowest shares of any cohort. There are smaller differences among generations over whether the term “cynical” describes people in their age cohort: 31% of Millennials say it applies, compared with 24% of Gen X, 16% of Boomers and just 7% of Silents. Relatively few across all generations – only about one-in-ten – say the term “rigid” applies. Millennials are more likely to characterize their generation as “idealistic,” but the differences are not large. About four-in-ten Millennials (39%) say the term idealistic applies to people in their cohort, compared with 28% of Gen Xers, 31% of Boomers and 26% of Silents. On three other descriptions – “environmentally conscious,” “entrepreneurial,” and “tolerant” – there are no significant differences across generations. To be sure, young adults are more likely than older people to say there is strong evidence of climate change and to prioritize the development of alternative energy over expanding the production of fossil fuels. Yet Millennials (40%) and Gen Xers (37%) are no more likely than Boomers (41%) or Silents (40%) to describe the people in their generation as environmentally conscious. And while Millennials are more accepting of homosexuality, interracial marriage and hold more positive views of immigrants, about the same share of Millennials (33%) as those in older age cohorts consider the people in their generation tolerant.